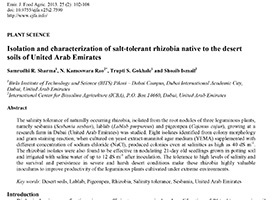 The salinity tolerance of naturally occurring rhizobia, isolated from the root nodules of three leguminous plants, namely sesbania (Sesbania sesban), lablab (Lablab purpureus) and pigeonpea (Cajanus cajan), growing at a research farm in Dubai (United Arab Emirates) was studied. Eight isolates identified from colony morphology and gram staining reaction, when cultured on yeast extract-mannitol agar medium (YEMA) supplemented with different concentration of sodium chloride (NaCl), produced colonies even at salinities as high as 40 dS m-1. The rhizobial isolates were also found to be effective in nodulating 21-day old seedlings grown in potting soil and irrigated with saline water of up to 12 dS m-1 after inoculation. The tolerance to high levels of salinity and the survival and persistence in severe and harsh desert conditions make these rhizobia highly valuable inoculums to improve productivity of the leguminous plants cultivated under extreme environments.